With Spring around the corner, I've been on the look out for the perfect products to give me that glowing radiant skin that every girl lusts after. I picked this up a while ago in my latest Benefit haul, and have absolutely fallen in love with it. I'm a sucker for Benefit packaging, I just think it's so pretty. 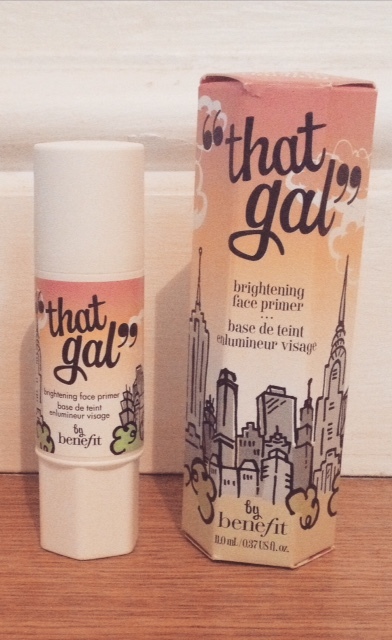 This reminds me of New York City, which is actually where I first discovered my love of Benefit Cosmetics. The bottom twists and I'm usually a bit wary of products packaged like this as I find they distribute too much product, but this gives off just the right amount. The primer is a pearly pink silky light liquid and only a tiny amount is needed. Blended in with fingertips, this primer feels weightless and is perfect for under make up, on its own, and can also be reapplied over make up throughout the day if you want a quick top up. I look fresh-faced, my skin looks brighter and more radiant, and my make up lasts a lot longer and doesn't slip down at all throughout the day now. I picked this up for £22.50 on the Benefit website and you can find the link to the product here. I think this will last a while as you really don't need much, and most of my Benefit products last absolutely ages. I will definitely be repurchasing this and think it is worth every penny.